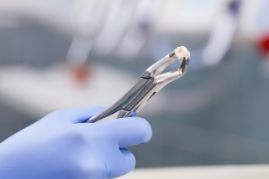 Learning that a tooth needs to be taken out can sound daunting to anyone, but the procedure is much easier than you might think. Not to mention that, when necessary, extractions improve your oral health and benefit you in the long run. In this blog, you’ll learn about 5 common reasons for tooth extractions and what you can expect from the procedure. Although extractions can feel intimidating, you’ll feel much better about the procedure after reading this blog! Fractures can occur from clenching and grinding, chewing on ice, injuries, and simple wear-and-tear. Small fractures can often be treated with a filling or dental crown. However, if a fracture has become too large or extends vertically through a tooth, it may not be salvageable. If a cavity has destroyed most or all of a tooth’s original structure, there won’t be enough of it left to support a filling or even a crown. In these cases, it’s often recommended to extract the tooth and discuss replacement options such as an implant, bridge, or partial denture. Although there are a few exceptions, most people need their wisdom teeth taken out at some point. In fact, it’s almost a “rite of passage” for young adults. Oftentimes there isn’t enough room in the jaw to accommodate these extra teeth, or they may be impacted or come in sideways. Also, even if the wisdom teeth aren’t currently causing problems, there’s a good chance that they will down the road. Many people are surprised to learn that gum disease is the leading cause of tooth loss. Over time, this common condition damages the gums and underlying bone that support the teeth and keep them in place. In advanced stages, the teeth can become very loose, making it painful to eat. If gum disease isn’t found and treated before this stage, extractions are necessary. Prior to orthodontic treatment, it’s not uncommon to extract anywhere from 1-4 teeth. This creates more room in the mouth to move the remaining teeth into their ideal positions and correct any bite alignment issues. First, your dentist will make sure you’re completely numb and comfortable. Although you won’t feel any pain, you will feel some pressure as the tooth comes out. After spending some time loosening the tooth, a dentist will use a pair of forceps to grasp it and remove it from its socket. Lastly, you’ll get post-operative instructions for how to care for the area and your dentist will discuss pain medication. Keep in mind that an extraction only has to be done once. But it will benefit your oral health for the rest of your life! Dr. Matthew Nawrocki is a general, cosmetic, and restorative dentist who has performed countless extractions over the years. He knows it can be upsetting to hear that a tooth needs to be taken out, but has a friendly, reassuring chairside manner that makes his patients comfortable from start to finish. If you have any questions about reasons for tooth extractions or the procedure itself, he can be reached via his website.